At least 25 people were killed and over 49 injured including 8 journalist in a twin blast in Kabul, the capital of Afghanistan on Monday. According to Associated Press, an AFP chief photographer Shah Marai and a cameraperson for a local TV station were also among the deceased. The Islamic State militant group claimed responsibility for the attack. The first attack took place near Shashdarak area, a VIP area which houses the offices of Defence Ministry, Intelligence officials, NATO and a number of foreign embassies. In the second attack which took place near southern province of Kandahar, 11 children were killed. The journalists died when a bomber disguised as a TV cameraman detonated a second bomb at the site of an earlier explosion. Forty-nine people were injured in the two explosions and were taken to hospitals, Tolo News cited the Interior Ministry as saying. The militant group said the intelligence services headquarters had been the target. 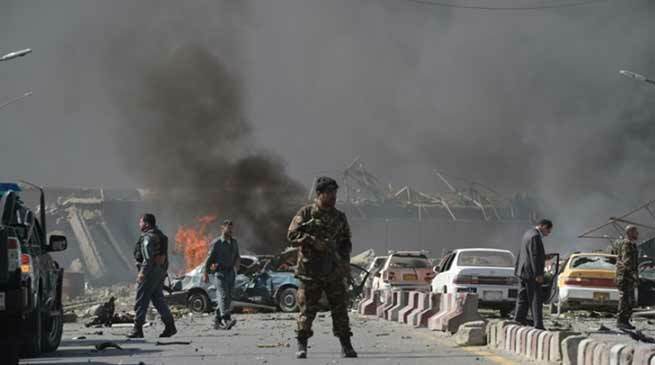 Afghan President Asharf Ghani condemned the twin blasts. “Attacks targeting innocent civilians, worshippers inside the mosques, national and democratic processes, reporters and freedom of speech all are war crimes,” according to a statement released by the Presidential Palace. Afghanistan has seen a spate of attacks this year. Last week, six people, including two Afghan soldiers, were killed when a car bomb exploded in Afghanistan’s Helmand province. On April 22, an Islamic State suicide bomber attacked a voter registration centre in Kabul, killing 60 people.